The Ramsey Farmers Market established in 2010 by the Ramsey Historical Association in coordination with the Boro of Ramsey, has become a wonderful part of our community where each Sunday during the past 2 summers and into early fall, visitors could buy a variety of fresh local food products ranging from organic produce and artisan breads, to fish, pasta, cheese, and gourmet olive oil. Focaccia anyone? One of the favorites at our Winter Market was Panzarella Foods where you could pick up some fresh mozzarella to go with their wonderful breads. Those in the know made a bee line each Sunday to the back of the Smith School multipurpose room where both Panzarella and Guy Jones’ Blooming Hill Farms were located. This past Winter the market moved indoors. Located at Smith School, the “Winter Market” was organized and staffed by Nancy Boone and her crew of wonderful volunteers helping out every week to make the first indoor market a success. Special thanks go out to Ellen Mass, our webmaster for the Market who along with Pat Confrancisco, Marcy Maita and Sharon Vogel covered our meet and greet table every Sunday. Sharon also delivered donated food items on Mondays (collected in our Pay it Forward bin), to the Center for Food Action. 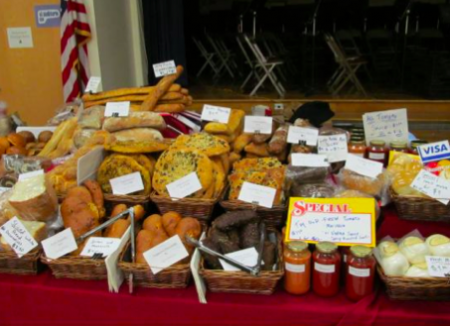 The Ramsey Farmers Market Proudly Announces Its Third Season!